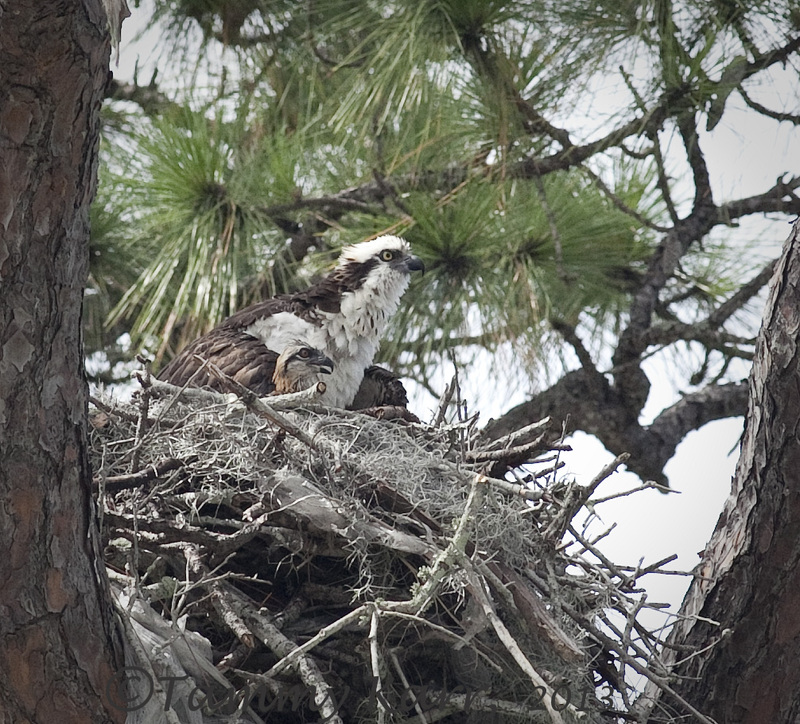 In January of 2010, a pair of Ospreys started gathering sticks and moss and began building a nest in a large tree in my neighbor's yard. Less than a month later, the nest fell. 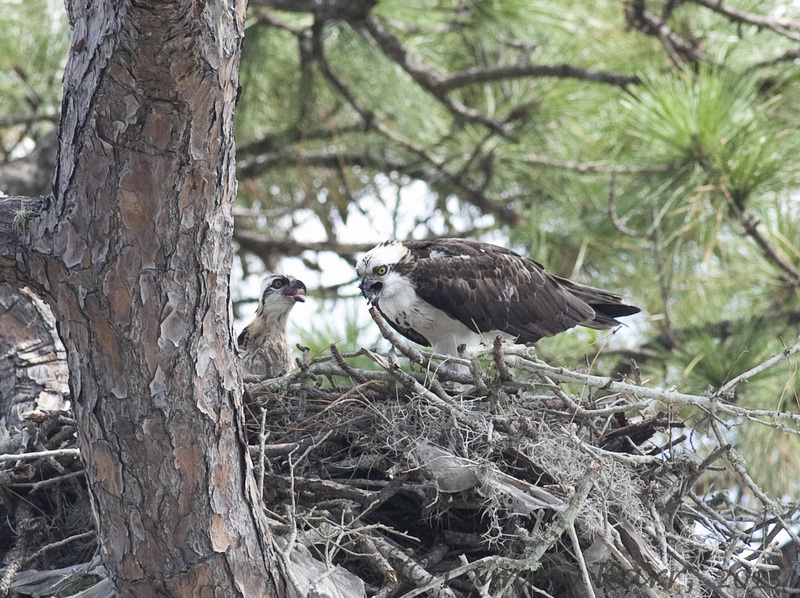 In 2011, the Ospreys were around but there was very little nest building action in the tree. 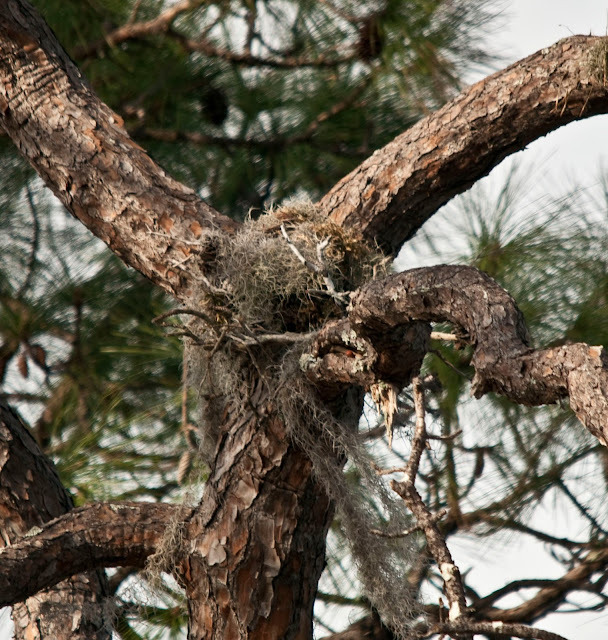 In 2012, a pair (not sure if its the original pair), successfully built a large nest. The pair spent several months in it, but did not produce any chicks. 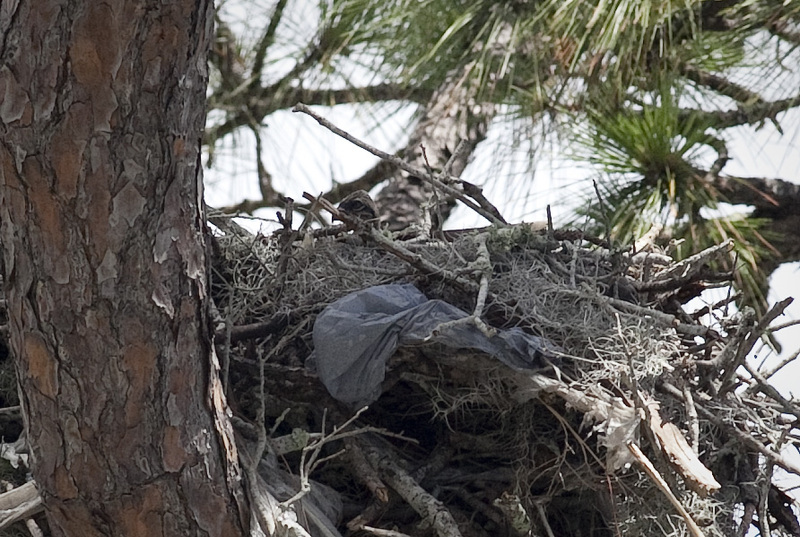 A pair has been occupying the nest since January of this year. Finally, one Saturday morning, about 3 weeks ago, I noticed this tiny head! 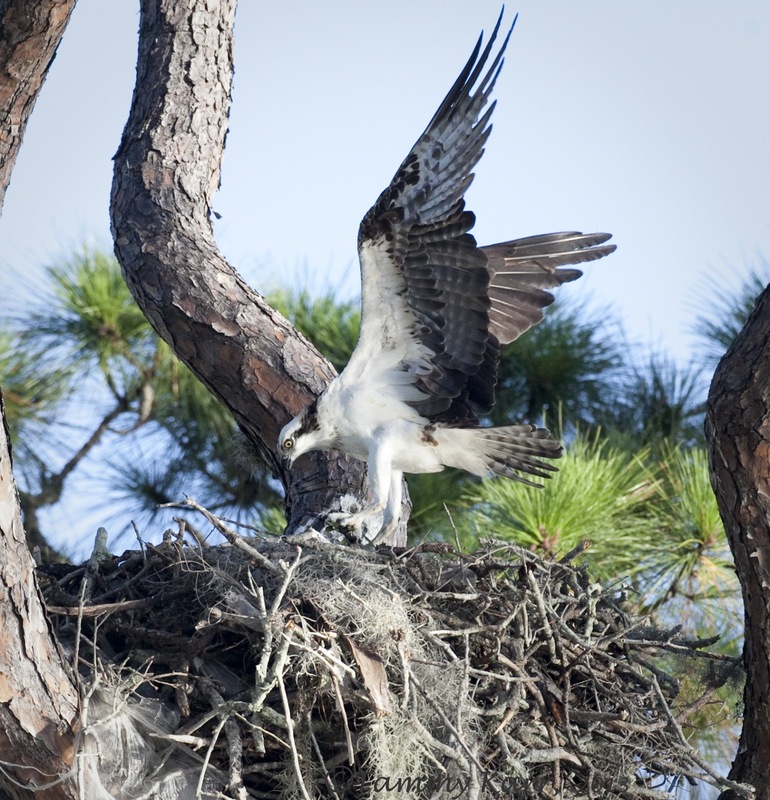 The female adult Osprey spends most of her time in the nest, using her wings to shield the chick from the sun. The male is rarely in the same tree. He does come by and drop off a meal from time to time. Mom also leaves the nest occasionally to catch a fish of her own. Mom does not welcome other birds near the tree. 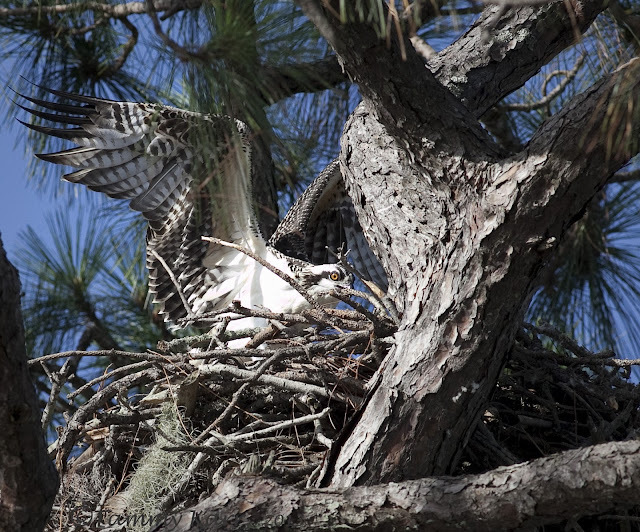 There are several young Red-shouldered hawks in the area and the Osprey gives them a stern warning when they approach too closely as this one did. The Ospreys aren't the only ones with a nest in this tree as they happen to share with some equally boisterous neighbors~Crows! On this occasion, Mama Osprey forgot her password to reenter the tree! The adult Osprey gives the chick a bite of fish for about every ten bites she takes. The nest about a quarter mile up the street recently fledged these 2 young Ospreys. Hi Tammy. Whow, what a buzz to have this family so close to your home. Super to see the youngster doing so well. Hopefully this could now turn into an annual event. It's great that they are so close. Amazing shots of the families! such gorgeous raptors! 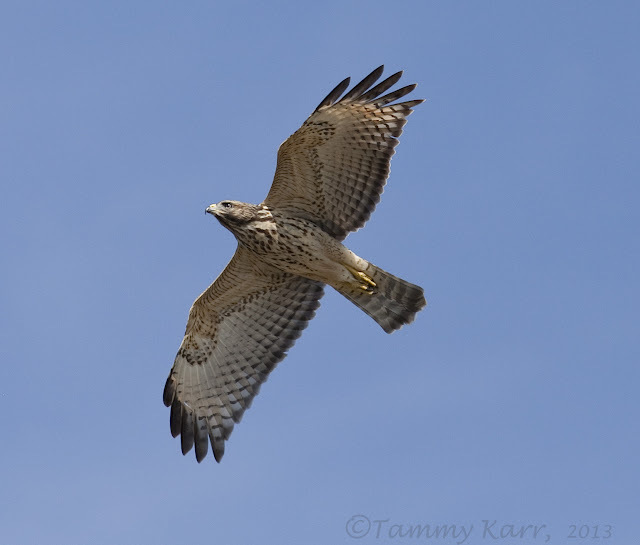 sharp-eyed and such wonderful feather patterns! 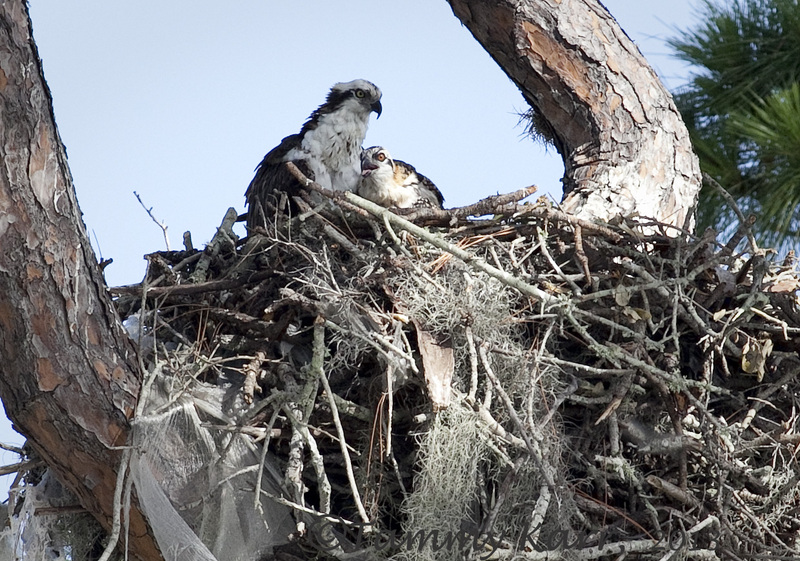 glad they (or a pair) were able to successfully nest! Hi Tammy, those are some pretty impressive shots. I'm glad I've managed to catch back up with you. Great view of the nest Tammy! you and that camera are a phenomenal pair! 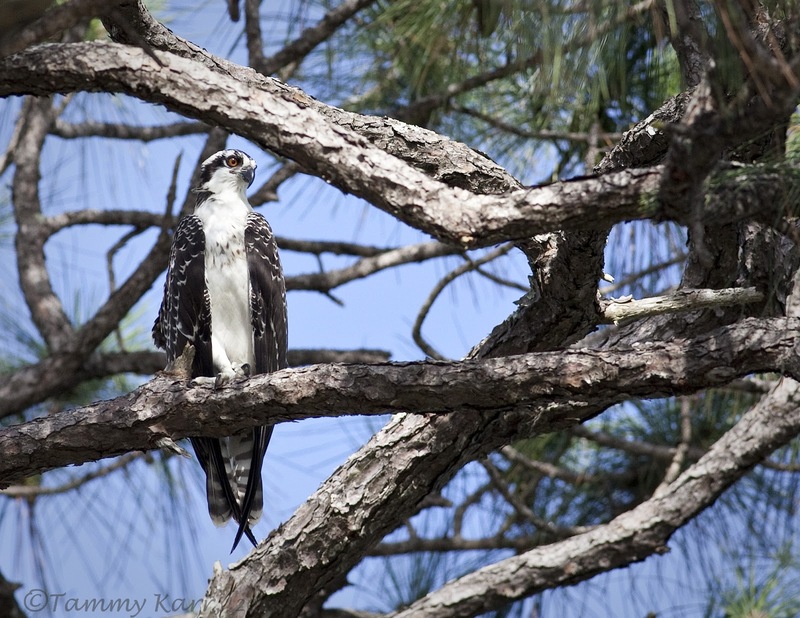 Hi Tammy, you out did yourself with these awesome captures of the Ospreys actions. Lovely series of this bird family. Photo five is my favorite. Awww... so awesome.. It's nice to see what I am missing at my own Osprey nest, since it is just TOO high for me to get a good view. 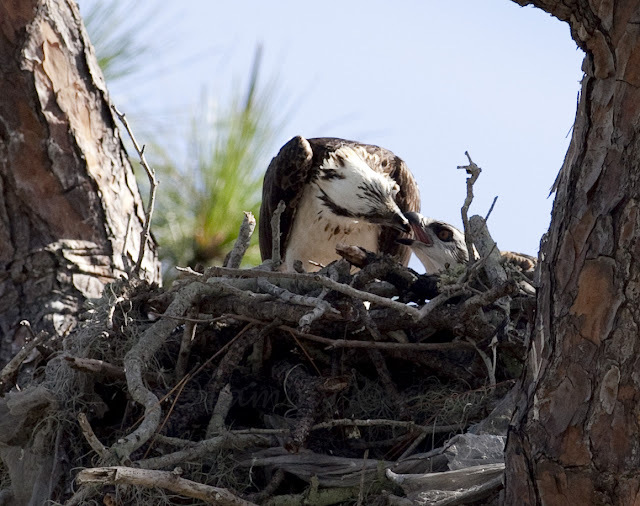 I love your photo of the little head peeking out of the nest :) The rest of the shots are gorgeous, a good reminder of what a hard job it is being a parent. It must be wonderful to follow this nest Tammy! I hope they return to rear another one next year. 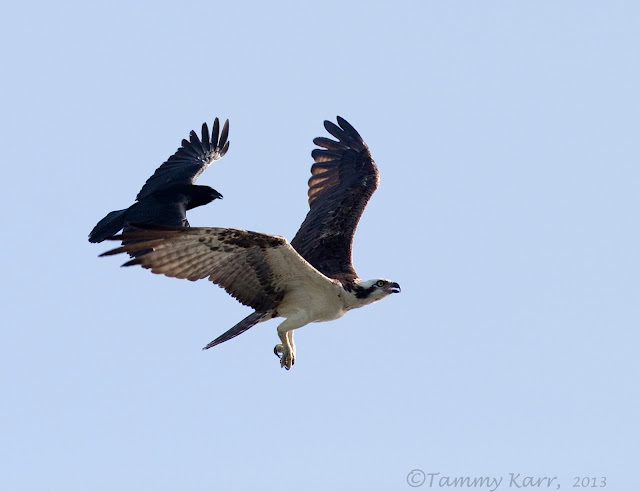 Tammy, awesome series on the Osprey. It is cool to be able to watch their nest! Great shots! Wonderful pictures. Love the crow chasing the osprey away. Wonderfull set of pics Tammy, I wish I could get such a set. Nice shots and great thoughts! Great series! 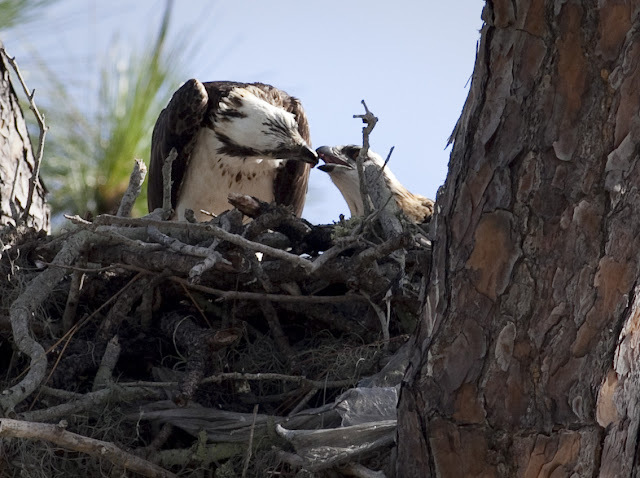 It's so neat to watch a new Osprey enter the world. Nice job! Great shots Tammy! Loved them all! Nice find, nice group of photos! Great series of shots from you Tammy, enjoyed the whole series.